To give the butcher block top a little distinction, I painted the base white. I also added contact paper to the shelves. I had noticed on the display unit that the shelves were pretty beat up and I'm pretty sure they aren't using the shelves nearly as much as we do so I wanted to put something down to protect them. This was also a good opportunity to add a fun pattern to the room. It took me a really long time to find a pattern I liked but finally found one at Ace. We haven't replaced the handles, but we are on the look out for some unique ones. Here's a side by side before and after to give you the full effect. 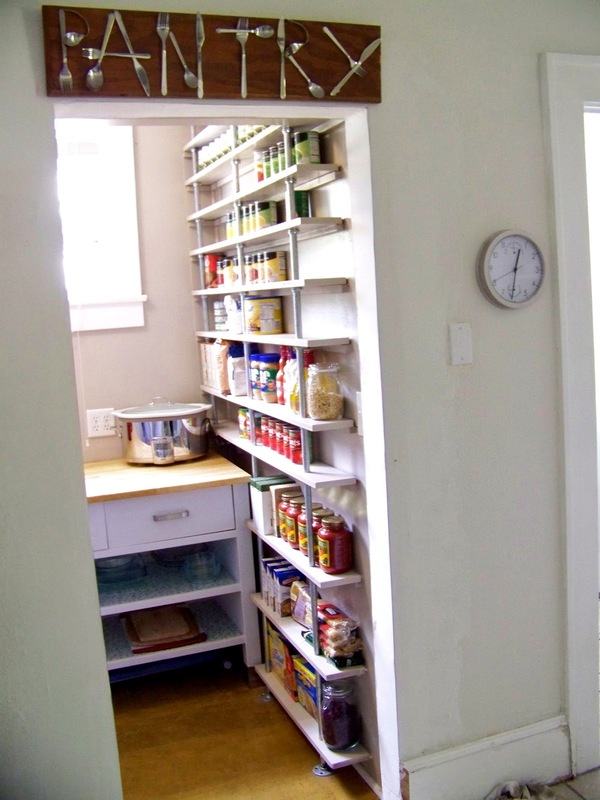 We can see the light at the end of the tunnel of this pantry renovation! Next week I'll have a pantry reno recap for you so you can see all of the little details we haven't shown you yet. 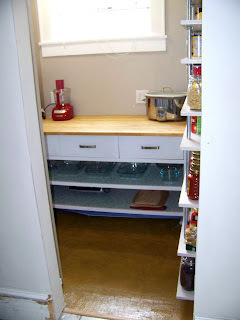 Nice pantry!! You've done a great job of making the Ikea unit your own. The contact paper was a great idea. New hardware will be a perfect finishing touch. 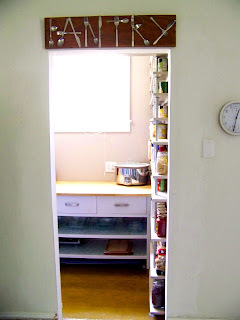 I must comment also on you pantry sign made out of...is that silverware??! Cute and a bit cheeky. I love it! Thanks! I'll make sure to check it out this week! This is a great project! What a great transformation! Would you consider linking it up to my Pinworthy Projects Linky Party over at Just Us Four? 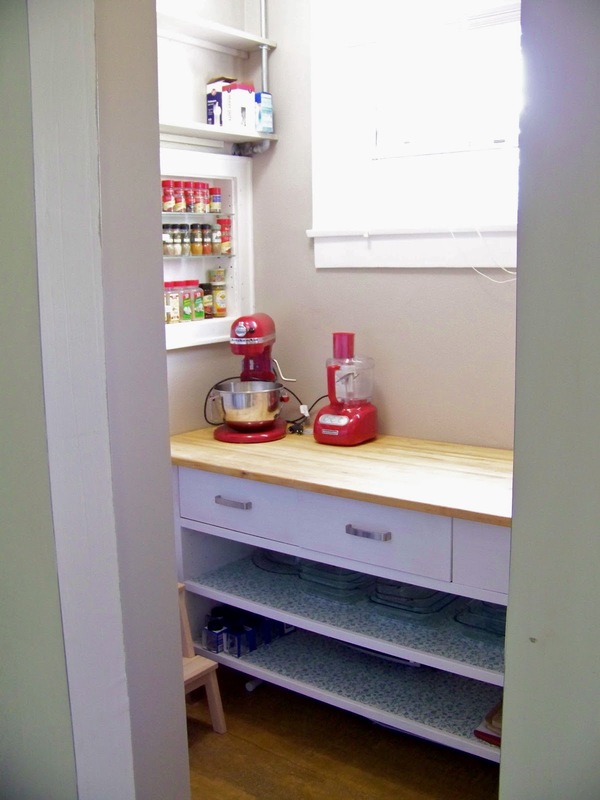 What a pretty pantry area! I love going to Ikea when we go to Phoenix which isn't too often. Heard they opened on in Denver last year and have seen it as we drive through- would love to stop in sometime! 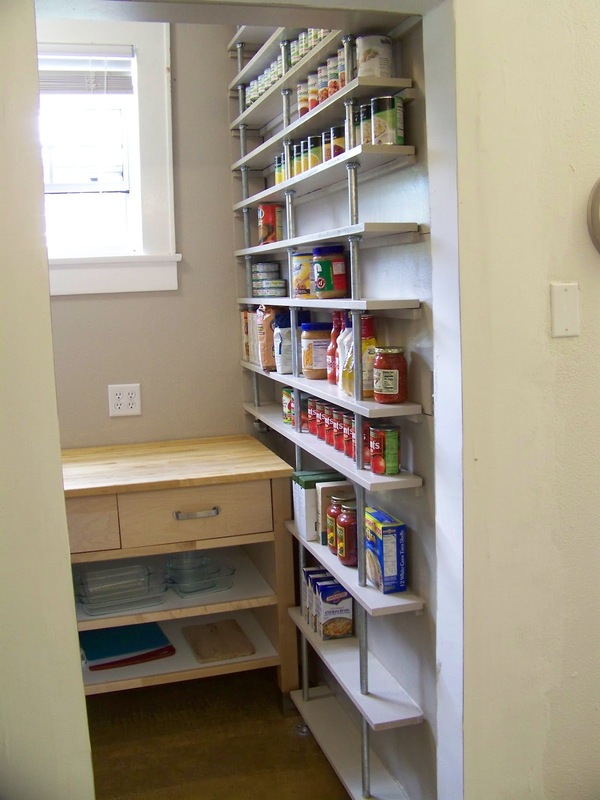 Well done, your pantry turn out so pretty! I love Ikea too, we have severals items from there. Your pantry sign is beautiful! Love the makeover you did on the Ikea unit. It looks 100% better! 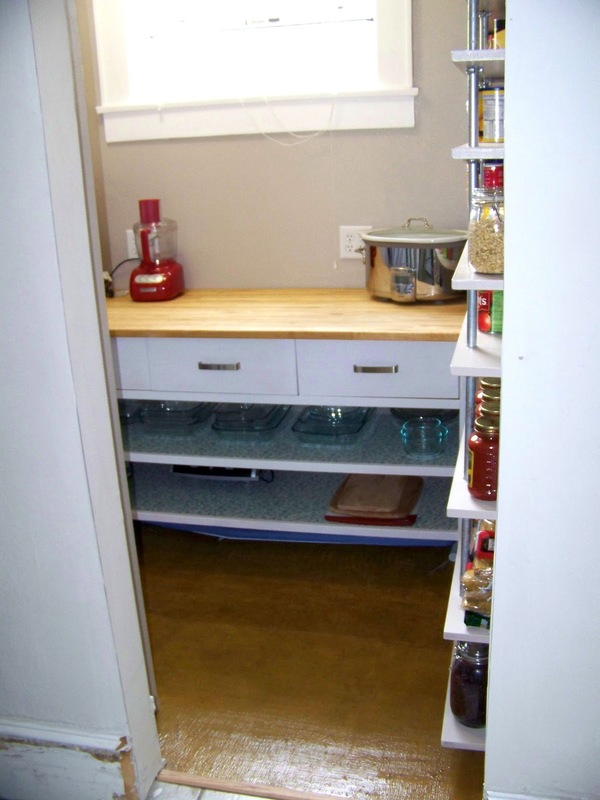 I envy your pantry...wish I had one like it. 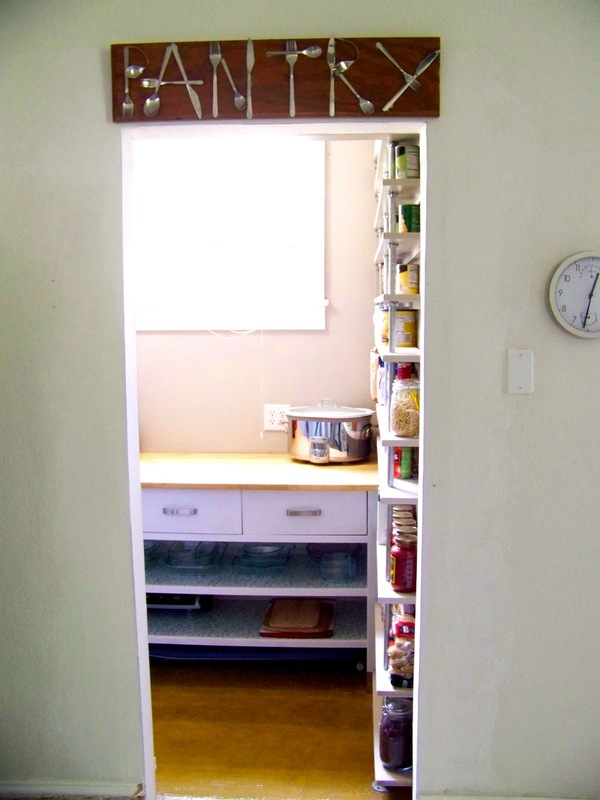 Your pantry sign is so cute too!! Found you through your guest post at Gail's MRL today!! Your pantry looks FAB; it's so neat and organized! 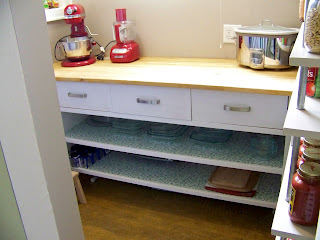 The white on the base of the cabinet looks great. I especially love the PANTRY sign too (and checked out the post). Spoons and forks mysteriously disappear at our house - I think it's time to buy a new set of utensils and use the old to make a sign of my own. I came over from My Repurposed Life to have a look around and realised ...I've visited here before!